KUALA LUMPUR: A container lorry driver was killed when his vehicle skidded and overturned at Km31.2 of the Karak Highway early today. 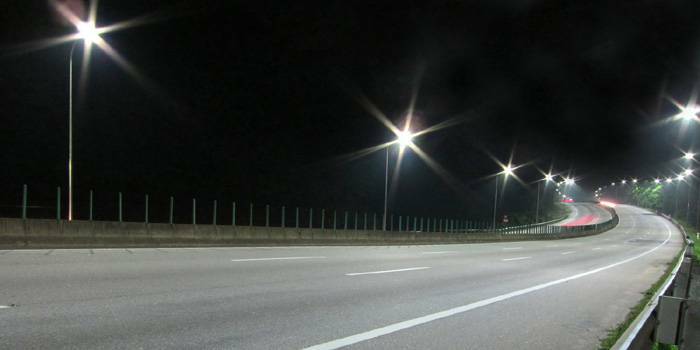 Gombak police chief ACP Abd Rahim Abdullah said Mohd Ramli Abdullah of Jerantut, Pahang, died on the spot in the 12.20 am accident. "His remains have been sent to Kuala Lumpur Hospital," he told Bernama. According to some individual, they believed accidents here are highly due to the supernatural forces in this area.They added, the drivers must seen something abnormal which led them to met with an accident. Based on a news from Star Online,it is proven that two were killed in Karak crash, and 17 including the driver were badly injured. 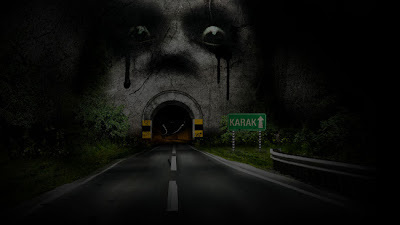 As we know, Karak Highway is an area that famous with supernatural stories. Due to this factor, accidents that happen here can be also related to the supernatural forces that revolving around this area. 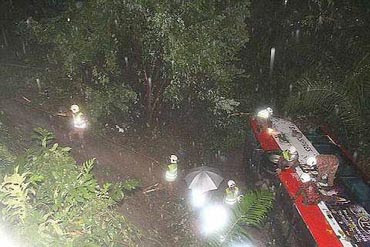 KUALA LUMPUR: Two passengers were killed and 17 others seriously injured when an express bus heading from Genting Highland towards the city plunged into a 10m-deep ravine along the Karak Highway yesterday.The identities of the victims, a man said to be a foreigner, and a woman from Seremban, both in their 40s, have yet to be ascertained.There were 45 passengers on board the bus and most of them were believed to be tourists staying in Genting Highlands. Most of the victims were not carrying travel documents.In the 6.30pm incident, the driver of the Genting Express bus crashed into a divider at the 25th kilometre of the highway.It is believed that the 47-year-old driver lost control of the vehicle, and veered left, in heavy rain.Gombak traffic chief Deputy Supt Mohammad Rafiq Mustafa said those injured were rushed to Selayang Hospital while the two bodies were taken to Kuala Lumpur Hospital.He said police would question the driver, who was slightly injured, to find out more details of the crash. The incident caused a massive traffic jam for more than four hours. Rescue underway: Rescue staff scaling down the cliff to assist in recovery operations at the crash site after the bus crashed into a divider and plunged into the ravine. My friend, Joe, one day decided to head back home to Pahang during the weekend. Because of the hot weather during the day, Joe decided to travel back home in the middle of the night instead. Usually, Joe goes back home using the only highway he knew from Kuala Lumpur, which was the Karak Highway. That night, in the middle of the long stretch of highway, he felt tired because of the lack of sleep the previous night. Thinking that he would not want to endanger his or anyone’s life, he pulled over to take a short nap. Suddenly, he was awaken by a tapping noise outside the window. Opening his eyes, he saw a little boy outside alone on the lonely and quiet highway. Scrolling down his window, he asked the little boy why was he alone in the middle of the night. The little boy then replied him that he was looking for his mother. The little boy asked Joe if he had seen his mother. Joe, finding the whole situation a little weird, started his car engine and told the little boy he had not seen a single soul throughout his journey. Joe then quickly pressed the accelerator and drove away leaving the little boy behind. After quite some distance, Joe looked back through his side mirror and saw the little boy runnning after his car. Quite stunned, he soon realized to his horror that the little boy was still running, this time, side by side with his 110 km per hour speeding car. The little boy was still trying to tap on his window at the same time asking Joe if he had seen his mother and that he was looking for his mother. Shocked, Joe stepped on the accelerator harder. Soon, he saw a police car at one of the rest area and reported the whole incident to the policeman. The policeman was calm and did not look even the slightest surprise or angry and told Joe that it was a common sighting at that particular area. Apparently (according to the policeman), there was a car accident recently at that particular spot. Both the little boy and his mother died on the spot. However, the little boy’s mother was thrown out of the car quite some distance from where the authorities found the little boy’s body which explains why the little boy would ask passerby if they had seen his mother. 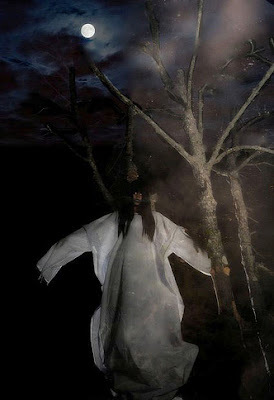 "Pontianak that has been found at Karak Highway"
Pontianak that usually found as beautiful lady at Karak Highway. There have been sightings of a pontianak flying on the highway at night. The pontianak is believed to be a woman who had died of childbirth and harbors immense hatred and anger. She preys on men and is said to tear their organs apart. Pontianak could come in the form of a beautiful young woman in white to seduce the men. Some motorists claimed to have seen a beautiful woman on the highway that could sometimes make heads turn and she could be by the side of the road, asking for a lift.